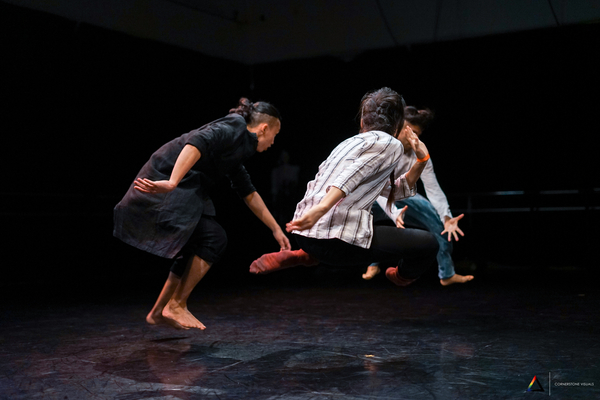 In this month’s dance podcast Chan Sze-Wei chats with Hwa Wei-An and Luqman, two dancers who move between the worlds of contemporary dance and street dance. 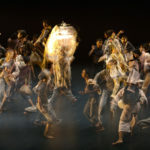 Wei-An is the organiser of Paradigm Shift, a contemporary-based dance platform taking place in Singapore that encourages exchange between contemporary dancers and dancers of different backgrounds. Luqman was one of this year’s participants. 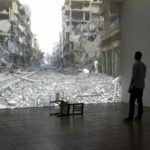 This year’s Paradigm Shift took place in May 2018. 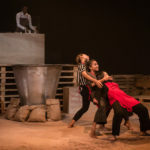 Listen in on the conversation as the three of them discuss their experiences of Paradigm Shift, the chasm between street dance and contemporary dance, and the meeting points of these ostensibly disparate dance mediums. 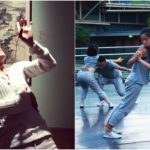 SW: Hi, welcome to the ArtsEquator podcast, and this week we have in the studio with us Hwa Wei-An and Luqman, who are both dancers somewhere between hip hop and contemporary and something awesome that’s happening in Singapore. We’re gonna talk about a dance event called Paradigm Shift that happened in May this year. That was the second edition hosted by Wei-An. Perhaps we could just start by introducing you both to our listeners. I understood very briefly that Luqman is the guy in the street dance scene who you can’t miss. Do you want to say a bit more about yourself? L: Okay. Besides being a loud person, like literally, well I’ve been in the scene since 2007. I’m 28 and I’ve been dancing for about 11 years. My base is in hip hop dance and currently teaching hip hop classes at Converge Studios and kids’ classes at DanceVault studios as well. L: My crew is called Flare Brothers. We did an event back then, called Lion City Throwdown, a Singapore based event that spread all the way through Southeast Asia. What we intended was to bring the world to Singapore, instead of Singapore dancers travelling out. So we save money and invite all the dancers in. SW: The thing I have to add is that Luqman is one of the co-champions of Paradigm Shift and Wei-An is the organizer of Paradigm Shift. When I first met Wei-An he was this B-boy trying to do ballet. But what’s happened to you since then? WA: Yeah. Am I being judged? WA: So I hoped to do Broadway and Cirque du Soleil-esque things in the future, and I know I needed to get full time training for that. So I ended up going to NAFA. After I graduated I was fortunate enough to land a job in Frontier Danceland here in Singapore right out of school. I was with that company for more or less four years till May of last year. Since then I have spent some time travelling around Europe and bouncing back and forth between Malaysia and Singapore doing the odd residency here and there, and organizing Paradigm Shift. SW: Okay, so let’s get to what is Paradigm Shift? Last year you called it a contemporary dance battle. But it’s more than that. WA: Yes. Paradigm Shift was born out of my desire to do something fun before I quit my job. And having spent a lot of time doing hip hop and street dance and breaking, I had met quite a few people in the scene, including Luqman and a whole bunch of other dancers but I never really had the chance to work with them much because once I entered NAFA and started dancing in Frontier time was fairly tight. So there was always this sort of dichotomy between being a contemporary dancer in the studio in the daytime and in the night enjoying going out to session and enjoying dancing with my friends from the street dance world. And also honestly many of my friends from the respective communities didn’t know each other and didn’t know about each other. Some people in the contemporary dance scene didn’t know what the Big Groove is, and some of my street dance friends had never even heard of the company that I had worked in for four years. I thought that Paradigm Shift would be a fun way to bridge that gap. I also felt that after working the contemporary dance scene for a couple of years I to some extent I felt that contemporary dance has become disconnected from what it claims to be, which is a dance of the times, when we have such strong influence from the street dance community and other dance forms as well which are present in Singapore and around the world. Sometimes I feel that we cut ourselves off from these influences. I thought that would be a good way to bridge that gap as well. As well as seeing some of the older street dancers in Singapore becoming interested in exploring avenues of dance that were not just 3 minute showcases or dance battles but ways of really telling stories and ways of exploring ideas and basically taking contemporary dance ideas into their forms of street dance. SW: So I’m really excited to see a lot of the things that are happening in Singapore. 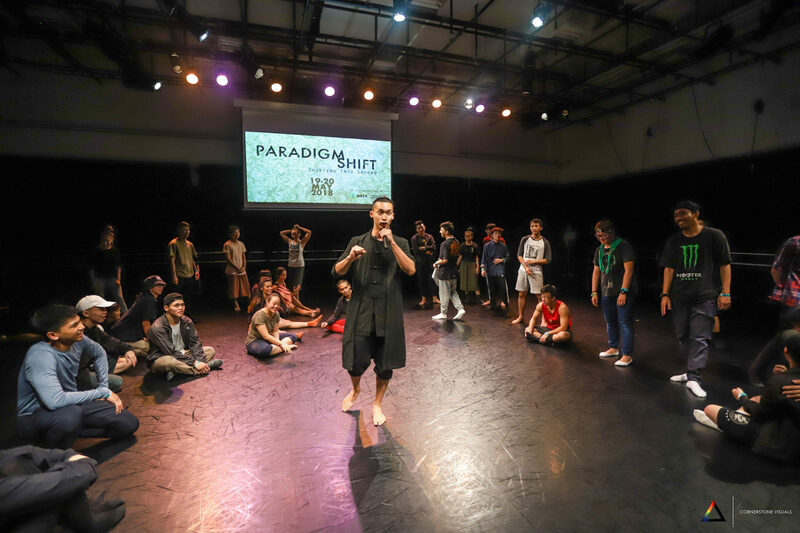 Paradigm Shift is one of them but there are several platforms where dancers of different backgrounds can come together and compete or cipher or learn things from each other. But let’s describe a little what Paradigm Shift was like this year to give our listeners a picture of what it was. It was a super open competition that anybody could enter, was that right? There were two parts, one day was a competition day and one day was a workshop day. Both of which were super interesting. And you had how many people in the competition to start? So many people in the studio. WA: We had if I’m not wrong, 49 competitors. SW: So from 49 you whittled it down to a final 16, and this was done through just one minute to show their stuff? WA: Actually they had three minutes. WA: Last year for the first round we jumped straight into battles. This year, also because there were more people who signed up this year, we went through what we called a preselection which would normally be just a dancer coming out and having anywhere from 30 seconds to a minute to just solo and show your stuff. But this year, trying to bring contemporary dance ideas rather than techniques into the competition, we required the dancers first, to solo, and then to introduce the next dancer. In this introduction, the first dancer’s task was to introduce the incoming dancer in a way that made the incoming dancer look good. And so you had to sort of drop the ego and “look at me” moment, to direct attention to the next person. SW: That was a recipe for a lot of fun. I’m not sure I even know all of the genres of dance that appeared in May. There were definitely contemporary dancers and people with different Asian dance backgrounds. Do you want to talk about the different fields, schools, genres in hip hop that people showed up from? WA: And from LASALLE, who came. And those were obviously contemporary dancers. WA: DJ FFINN; she’s a local DJ who runs a record label called Slug Wife with her husband in the UK. SW: She was going through a lot of different genres of music as well. So after you cut down to the final 16, you had these elimination rounds, and I know you thought really hard about what to do. It was quite creative. There were some choreographic challenges, there was your Iron Chef challenge, would you like to say a little bit about that, and your judges? Luqman: That was what round? What did we do? WA: The semi final. Top four. I will explain. WA: The semi-final drew inspiration from an old TV show called Iron Chef where a challenger shows up and picks either the Chinese, French or Japanese chef. SW: But in this case it was your judges who are eminent local and international dancers, or their representatives. And who did you have judging this year? WA: We had Ms Low Mei Yoke, Artistic Director of Frontier Danceland, representing her for the dancing was one of the company dancers Adele Goh. And we had a lady called Kaier. She is part of what is known as the Mover community, which is sort of fitness movement that tries to draw from what they call natural human movement – running around in the wild and climbing trees and whatnot. And although Kai is not a dancer by training she has done a lot of cool dance stuff and a lot of cool things and she has a great eye as a photographer who takes pictures of dance. SW: And you had Christina. WA: Christina Chan, the local dancer and choreographer. WA: B-boy Sonic, or Daniel Rojas from the B-boy community from since forever. SW: And where’s he from? WA: Sonic is from Denmark. He represents the crew called Natural Effects. SW: So the Iron Chef challenge was that each of the contestants had to pick one of the judges or their representatives to dance with, with no prior preparation. Luqman, who did you dance with? L: I danced with last year’s champion, which was Adele Goh. SW: How did that go? L: Wow. [Laughs] I’ve been freestyling for some time, but for this thing it’s totally, I’m totally surprised with how it ended. I didn’t even know how to start. SW: I remember you guys brought out the anatomical skeleton that was hanging out in the NAFA studio. He was a big part of your story. What happened? SW: I was so scared you were gonna break it. SW: It wasn’t very serious. SW: Somehow it was an improv that the two of your just managed to hold together. That was your semi-final. So tell me please about the final, because I’m so bummed that I left and I missed it because I was tired! That was a final between Luqman and Nic Chung. 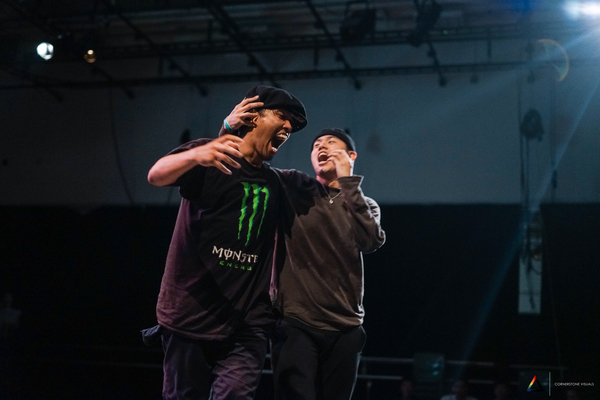 WA: Luqman and Nic Chung actually belong to another crew together called the Mellow Maniacs and they actually made it together to the finals of Singapore Dance Delight last year. So they’ve had quite a bit of experience dancing together. The finals was meant to be a sort of release where you’ve thought so hard through the choreographic challenge of the quarter and semi-finals, and then in the finals basically the instruction is that the DJ is gonna play music. You start when she starts and you stop when she stops. That was all the instruction they were given. Luqman and Nic Chung instead of deciding to battle each other, which is what I suspected would happen if they were just two random people, decided to work together to give us this pretty epic and pretty funny showcase. Do you wanna talk about it Luqman? SW: Just one favourite moment. WA: And Nic just completely ignored Luqman. SW: Cool. So that was the competition segment. But the second day, which was something you didn’t do last year, was to bring together street dancers and contemporary dancers to co-teach workshops. I understand from some of the dancers who taught the workshops together and some of the reflections they had afterward, that it was really a kind of real surprise and a revelation and a joy to be working together and discovering things that they didn’t expect. What was your idea in trying to bring together a contemporary dancer and street dancer, most of whom didn’t know each other very well, to bring them together to co teach? That’s super unusual. WA: The main intention for these collaborative workshops was to bring senior or experienced dancers together to share their art forms with each other as a way of bouncing ideas and motivations and thought processes off each other, more than techniques actually, so they could inspire each other by the way they think and by what inspires them. And through this exchange, hopefully, they could create a workshop that was a result of the exchange between them rather than simply “I do this, and you do this, and let’s do this step from this style and chuck it together.” The aim was to see how their ideas could challenge each other and help them push each other forward, and to develop a workshop out of that. WA: Josh Lee, who’s a popper. SW: I’m just gonna pick one paragraph out of here because it’s so beautiful. She’s talking about their first encounter, trying to work out what the workshop material was like. “About ten minutes in, I could already feel our brain waves syncing up. We hadn’t even moved on to talk about the workshop, yet we were already noticing similarities and links in the way we think and how we get inspired and learn about ourselves and the world around us. Our conversation was like a ball bouncing happily from one side to the other, the momentum constant and alive. So that’s just an excerpt from a post that Faye wrote. Maybe let’s just zoom back out a bit. I think there’s this conventional impression that street dance and contemporary dance are these two entirely separate world in Singapore that don’t meet and don’t really appreciate each other very much. But when I go to an event like Paradigm Shift and everybody is having so much fun, just roaring with appreciation and enjoyment of what each other are doing – I was sitting with a bunch of contemporary dancers and I think we were shouting the loudest for a lot of the street dancers, and there were street dancers who were cheering the loudest for a lot of the contemporary dancers. So what is going on? Are we missing something? WA: When you look at dance in Europe, for example, what’s happening now is that a lot of street dancers, both crews and independent dancers have started to develop their contemporary works and that is part of the natural progression of dance, where you go deep into the artform that you love, and then you find different avenues to utilise your art in. So it doesn’t stay the same but the art grows and evolves as you learn to tell stories and express ideas in platforms that aren’t, as I said earlier, 3-minute showcases but long and spanning the length of an evening. 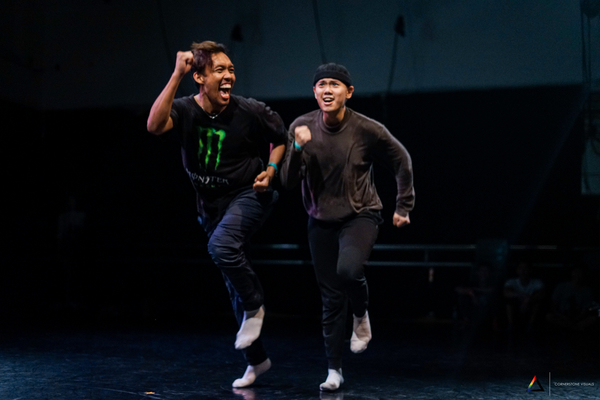 I think the scene in Singapore is still young, both the contemporary dance scene and the street dance scene; we just haven’t had the same number of years that the Europeans or Americans have had, to just develop and push ourselves in this direction. 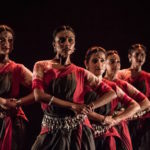 We also haven’t had dancers who have crossed over between different genres, and access to different theatres, and different opportunities to watch performances and get exposed in different ways. All these things factor into how the scene develops and what we appreciate and thus what we ourselves want to do and create. SW: Luqman, what do you think? L: I think that the whole thing you miss maybe is the people that came together for Paradigm Shift were people of similar frequencies. I would say that the mentality is… not that they were bored…taking from what Wei-An says, I think most of the time they just wanna have fun. In this world, especially in Singapore, the culture here is like exams – you study hard, you’re gonna get A. That’s a definite yes. So most of the younger generation, and my generation, we apply it to our dance the same way. However contemporary dancers don’t do that. So they will train hard, yes, in terms of technique. But in terms of your art, artistry that might not be right… but there’s no such thing as right or wrong you see. So when street dancers, we look at contemporary dancers, we see: Wow, so open, so fresh, so fun. It’s like a playground. So I think the people who came for Paradigm Shift, they just wanna have an exchange. 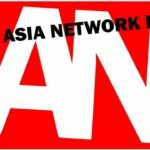 I think what Wei-An has been trying to do right now is to create, not a cult but more of a movement that eventually will become addictive and people will wanna exchange and Singapore will eventually boom into a bigger place not just in terms of hip hop or contemporary, but just a fusion of dance. SW: I think I get what Luqman was saying about how the crowd that came together both to compete and to watch for Paradigm Shift was a very special group. Because there was this sense of curiosity and hunger and wanting to try things out, a real sense of openness and that’s really beautiful. Wei-An, are you optimistic? Where do you want to take it from here? WA: But I hope it will keep going and really just to establish a platform for dancers of different kinds to inspire each other and to find ways to work together as well, so we’re not always waiting for an opportunity to work in a dance company or an open call from a festival. But we’re finding ways to create with each other on our own terms. SW: For a last thing, if you guys would like to give a shout out to initiatives that you know are ongoing, besides Paradigm Shift. Or specific dancers who are working in any part of the dance community: things which you think are really interesting that we should know about? WA: There’s a whole list. First of all we have Open Concept, by Nic Chung, the other co-champion of Paradigm Shift and Luqman’s fellow Mellow Maniac. (L: He’s the maniac!) 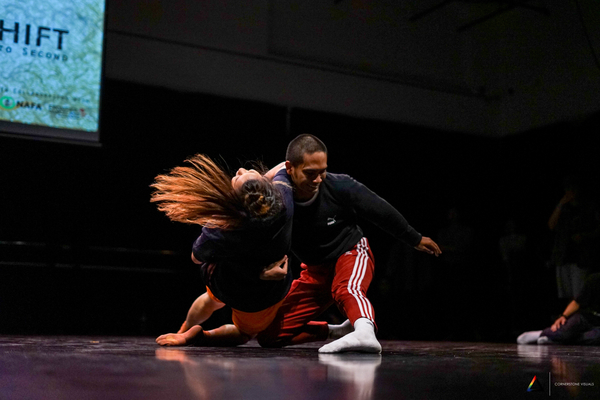 Open Concept is on the 30th of June and runs on a fairly similar intention of getting dancers to dance to different kinds of music in different kinds of settings. SW: It’s open to different genres too right? It’s open to any kind of dancer. WA: Different genres, yes. We also had Culture Circle just last weekend, which if I’m not wrong is organized by the Legacy Dance Company, which is also an open styles dance battle, 2-on-2. They’re trying to do different things with the judging to make dancers think differently and to work differently as well. In August we have a group of dancers, Scrachmarcs, which is Rachel and Marcus Tan, as well as other dancers called Amin Alifin, Gerald Chan and Marcus Leong. They are coming together to put up a self-produced dance theatre piece. Most of them come from street dance backgrounds, so that’s definitely something that should be checked out. It’s happening on the 9 and 10 and August. So if you don’t want to watch NDP, go and watch their show. L: I will just give a shout out to my own even then. It’s in November and it’s more of a hip hop battle. It’s called the Exchange. Basically what I’m trying to do is to get dancers from different places to come together. You freestyle, but don’t have a boundary. For example, if you work with a Singaporean to a Vietnamese dancer then they have to come up with something. A choreography or a tag, [even if] they can’t communicate well [with a language barrier]. That’s what I’m aiming for. it’s called the Exchange and it’s happening on 24 November. So do check it out. SW: Okay. Thanks guys. Good luck, and thanks for joining us this evening. WA: Thank you very much! Paradigm Shift took place 19 – 20 May 2018 at Nanyang Academy of Fine Arts Campus 3. Learn more about Paradigm Shift on Facebook, Instagram, or by e-mail.